M11 Essex northbound severe accident, between J5 for and J6 for M25. M11 Essex - One lane closed and queuing traffic on M11 northbound between J5, Loughton and J6 M25, because of an accident involving a lorry and a car. Next time you're at Stansted Airport, keep a look-out for Holly the police dog and her handler PC Hayley Peek. The pair, along with PC Mark Webster and police dog Buddy, pictured with the chief constable, have just completed an eight-week course in the search and detection of explosives, and will be on operational duties from next week. Ch Con Stephen Kavanagh said: "The security and the safety of passengers and airport staff is a key priority for our force. "I'm delighted we are strengthening our team with these new additions." Ahead of regular free music sessions for young people at the Jaywick Martello Tower, which will be held every Tuesday from 7 November, a drop-in session is being held there on Saturday, between 12:00 and 15:30. Eight to 18 year olds can go along and meet the organisers and play some instruments. The sessions are being provided by Harwich-based charity We Are Music. Susan Barker, who looks after culture and communities at Essex County Council, said it has been able to make the music sessions happen through joint funding from the Arts Council and the Music Hub. M11 Essex northbound severe disruption, at J8 for A120. M11 Essex - M11 lane blocked on exit slip road and heavy traffic northbound at J8, A120 (Bishop Stortford), because of a broken down vehicle. Pepper the £17,000 robot will be used to deliver social care services in Southend. M11 Essex northbound severe accident, between J7 for A414 and J8 for A120. M11 Essex - Queuing traffic and one lane closed on M11 northbound between J7, A414 (Harlow) and J8, A120 (Bishop Stortford), because of an accident. Travel time is 30 minutes. We reported earlier there had been an increase in complaints from passengers using Greater Anglia. Figures from the Office of Rail and Road show a rise of 17% in complaints in the first quarter of 2017-18, compared to the same period last year, with 58 complaints per 100,000 passenger journeys. The highest proportion of the complaints, 25%, was about delay compensation. Greater Anglia said where passengers had been let down it needed to "compensate them properly, fairly and appropriately". A woman who suffers from Ehlers-Danlos syndrome is trying to raise £130,000 for lifesaving surgery. 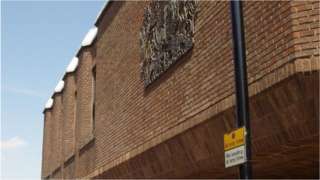 A multimillion-pound restaurant development has been temporarily stopped in its tracks, as structures have been built in the wrong place. As the Daily Gazette has reported, the buildings at Stane Park in Stanway are just centimetres away from the original agreed plan. Churchmanor Estates, which is behind the project, says work continues on the Stane Leisure Park, but there is likely to be a six-week delay due to a setting out error. Rose Builders, the main contractor for the Leisure Park, said: "Human error in setting out the GPS co-ordinates incorrectly has led to some of the works being built in the wrong position. "Nevertheless we are sorting this problem out, but the major part of the construction work including to the car park, drainage and access roads are all continuing apace." Stephen Clark, of Churchmanor Estates, said: "These things happen and sadly a small human error has led to a slight delay in completion, but the good thing is that the leisure park will, after a five-year wait, be finished next summer." M11 Essex southbound severe accident, between J8 for A120 and J7 for A414. M11 Essex - M11 partially blocked and very slow traffic southbound between J8, A120 (Bishop Stortford) and J7, A414 (Harlow), because of an accident. M25 Essex anti-clockwise severe disruption, after J27 for M11. M25 Essex - Two lanes closed and queuing traffic on M25 anticlockwise after J27 M11, because of a broken down box van. Greater Anglia admits it needs to "keep on" improving performance, as figures from the Office of Rail and Road reveal a rise in passenger complaints. On average, people are twice as likely to complain about Abellio-owned Greater Anglia than other operators in England. Spokesman for Greater Anglia, Jonathan Denby, said: "What we need to keep on doing [is] further improving performance, making it better, and in those places where we let people down for whatever reason... then we compensate them properly, fairly and appropriately for the service they've not had." We'll take a closer look at the figures and bring you more on those a little later, but in the meantime, if you've got an opinion on the story, share it with us via the "Get involved" link at the top of this page. After a chilly start, any early mist patches will clear to leave a mostly dry and sunny day, feeling pleasant in light winds. However, the odd light shower is still possible along the coast during the morning. Remaining dry overnight with clear spells and light winds, although it will become chilly, with a grass frost forming in some rural parts and local fog patches. Get a more detailed forecast for wherever you live, from BBC Weather. Brian Truan, 80, tells a court the accusations are being made for financial gain. Cloudy this evening with some patchy drizzle across the BBC East region. Clear spells inland bringing temperatures down to 5C (41F), but coastal cloud will hold the temperatures to a low of 11C (52F). Friday will see a few light showers in north east Norfolk, and elsewhere will stay fine with bright or sunny spells, but feeling colder with highs of 14C (57F) in moderate to light north and north westerly winds. For a more detailed forecast where you are, visit BBC Weather. It's St Cedd Day today... marking the anniversary of the death of the patron saint of Essex. The saint was born in 620 AD in the north of England during the era of Anglo-Saxon kingdoms. Cedd was one of four brothers ordained as priests, and two of them - including Cedd - later became bishops. He became a missionary who landed at Bradwell-on-Sea and soon built Saint Peter’s Chapel at the nearby Fort of Othona in 643 AD. He often visited his childbood home, and in 659 AD King Ethelwald asked him to establish a monastery in Northumbria. Cedd chose a site at Lastingham, where he died in 664 AD after catching the plague. A police investigation is under way following reports of a courier scam targeting elderly victims. Officers have received three reports of fraud in Colchester and Wivenhoe, which happened between 16:20 on Tuesday and 19:20 yesterday. The victims, two women aged 77 and 90, and a 91-year-old man, were tricked into handing over substantial sums of money. They'd been contacted by people claiming to be from the Serious Fraud Office who told them there were issues with their bank accounts and were advised to withdraw thousands of pounds to be picked up by a courier. In two of the incidents, the money was collected. On the third, the bank grew suspicious and called police before any cash was withdrawn. Det Insp Jim White says they urge people to be vigilant and to not fall for these scams. In March 2015, Cambridge United supporter Simon Dobbin was left permanently brain damaged after he was attacked by rival football fans following a match in Southend. He spent a year in hospital before returning home to Mildenhall, but is unable to walk or talk and needs 24-hour care. The BBC programme, DIY SOS, is stepping in to help the family modify their home to Simon's care needs and has enlisted the help of local trades people and businesses. The building work is yet to begin and filming is to due start next month. One of the first to announce its support for Simon and his wife Nicole was Bussens & Parkin, the builders merchants and DIY store in Mildenhall. Its manager Alex Highton says the shop is "very much part of the community". "A lot of staff and customers know Simon's family... lots of suppliers got in touch and said they'd like to be involved, everybody wanted to help in every way they can". We said to the show, whatever you need from us, we're happy to do, we always get involved in stuff in the community, and we only survive on the back of the community because we're a family business".